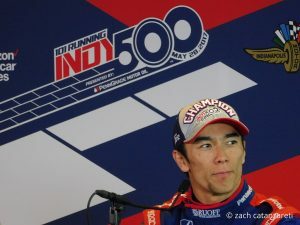 Seeman Holtz Property & Casualty, the Boca insurance agency that has been expanding aggressively, also worked this weekend to raise its profile by sponsoring Indianapolis 500 driver Takuma Sato. The Boca insurance agency was an associate sponsor on the No. 30 Mi-Jack / Panasonic entry for 2017 Indianapolis 500 champion Takuma Sato for the 102nd Indianapolis 500 on Sunday. “It’s great to have Seeman Holtz Property & Casualty Inc. join our team for the Indy 500,” said Bobby Rahal, co-owner of Rahal Letterman Lanigan Racing with David Letterman and Michael Lanigan. Seeman Holtz branding appeared on Sato’s race car as well as on the sleeve of his race suit and in view on the in-car camera. Seeman and Eric Holtz started Seeman Holtz in 1998, to help people with pre- and post-retirement planning. Since then, the Seeman Holtz family of company has expanded to include coverage for home, life, auto, boat, private client and business insurance. And it continues to expand through acquisitions. The Boca insurance agency has been on a major expansion push. Earlier this month, Seeman Holtz Property & Casualty announced the acquisition of First Choice Insurance Agency of Poplar Bluff, Missouri. It was the latest in a series of acquisitions. The company announced the acquisitions of 24 companies in 2017. This year, the company has continued that growth. The Boca insurance agency has announced the acquisitions of Xponent Employer Solutions of Scottsdale, Arizona; Fifth Avenue Healthcare Services of Tulsa; Missouri-based Tri-Star of Sikeston, Inc. DBA Self Insurance; the Federal Employee Insurance business of Federal Employee Services, LLC, of Edmond, Oklahoma; and Elton Porter Insurance Agency of Houston. Earlier this Seeman Holtz Property & Casualty announced it had acquired the book of business from Affiliated Insurance Managers, Inc., headquartered in Morgan City, Louisiana.